Most other card companies require you to sign a contract when they send displays to your store, locking you into their card programs whether they sell well or not. We believe a retailer will avoid signing a contract in order to maintain total buying control and flexibility. At Stockwell, we’re so confident that our cards are the best-selling product, at the best possible price that we give the displays to you without asking you to sign a contract. You own the displays “free and clear” with no strings attached. All displays come complete with cards and shipped directly to your stores with freight included in the total cost! Order online, by phone or by fax. Our card experts have the industry wisdom and experience to work with you to develop a card program that is customized to your needs. Whether you want a small counter top display with a selection of specialty cards, or a full 28 foot department, we have the solutions for you. Together we can develop a greeting card department that will help you build store traffic and increase your profitability. We really are a great great bargain ! Our beautiful four foot wooden displays show off a large portion of each card, revealing all the beautiful colors on our cards. All of our setups come with category locator cards and all of our cards and envelopes are manufactured of equal size, helping you and your staff maintain neat and orderly displays. An additional feature that we offer, at no charge, is the electronic setup of your card department. We keep track of design in every category that we ship. This enables you to receive a rotation of designs, avoids duplication, and allows for easy reordering. Shop well with Stockwell. When you buy our cards, you're saving American jobs! This will attract shoppers to your card department, making purchasing easier, which translates into greater sales for you. View all display deals here. Revolving 48 and 72 pocket metal displays filled with 576 greeting cards. The display AND the greeting cards are made in the USA. 30 pocket free standing white heavy-duty cardboard display filled with 360 greeting cards. Display AND greeting cards are made in the USA. 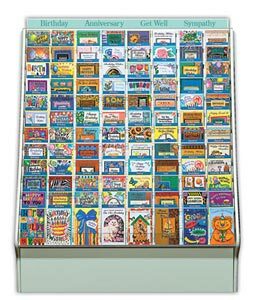 One four foot premium wooden cabinet with 1,152 greeting cards. All greeting cards made in the USA.